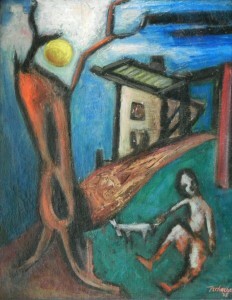 From 1930 until his death in 1984 Nahum Tschacbasov was a uniquely transformative artist. Inspired by varying influences during the course of his life Tschacbasov’s work was in a constant state of metamorphosis, as he developed new techniques and mined new perspectives. 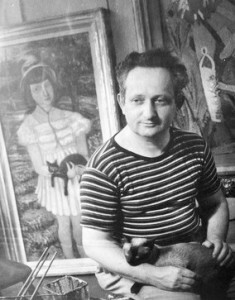 Highly successful and in great demand during his lifetime, spoken of and exhibited with Picasso and Calder, Tschacbasov is one of the sleeping giants of the contemporary art world. The canvases of Russian-born artist Nahum Tschacbasov are filled with familiar themes — quasi-religious imagery, romantic landscapes, not-so-subtle references to being an artist. With brushstrokes reminiscent of Peter Doig and ghostly figures that echo Picasso’s, the paintings evoke a pleasant feeling of deja-vu. Most art admirers are probably unaware of the Tschacbasov’s prominence in the United States– maybe it’s the extremely Russian-sounding name. Born in Baku, Azerbaijan (a territory of Russia back in 1899), Mr. Tschacbasov dominated the New York art world from the 1930s to the 1950s, displaying his intricate, symbol-laden works in the halls of art havens like the Whitney Museum of American Art and the Metropolitan Museum. He painted alongside Mark Rothko in the Dissenters Ten, formed his own fine arts school in Woodstock and even threw his expertise into the teaching academy of the Art Students League.